On Tuesday I am participating in a lecture about nanotechnology at the Bocconi University in Milan. This is not a subject that is new to this website as a quick search demonstrates. In May of 2011 Hayley asked the question of whether nanotechnology research is safe. It is a well written and commented post that raises some critical questions about the ethics and practices surrounding technology that is already changing our lives and has incredible potential in many walks of life. Hayley continued her thread in January of this year with an article about nanobots, the future of nanotechnology. Here she describes the bottom up approach that the technology is taking on, underlining the importance of self replication. In March I followed up on these articles with a post about how nanotechnology procedures are regulated, based upon the National Research Council’s report of the same month. Many similar issues are raised in the report about environmental damage, possible risks to health and governance. On a lighter note in April I posted about nano-art and again in May about how nanotechnology is making waterproof electronics a reality. So all of this leads me on to Tuesday’s lecture. 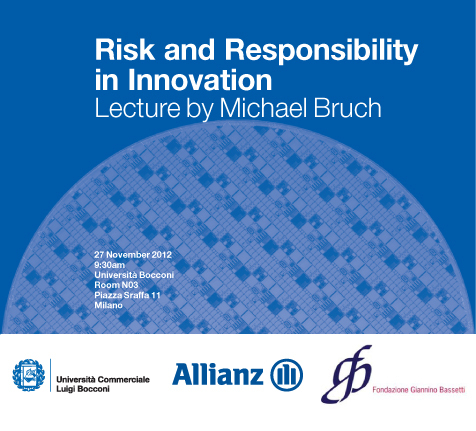 The main speaker is Michael Bruch, the Head of R&D and Risk Consulting at Allianz Global Corporate (the insurance company). He is going to talk about the role of insurance in innovative technologies, with a focus upon nanotechnology. If we read the articles linked above we understand that this research is fraught with risk, and so development companies have to take out insurance against losses, but how can the level of risk be calculated with such an unknown and potentially powerful product? What might the implications be for the global financial system if something goes catastrophically wrong? Well if anybody can tell you Mr Bruch can. The proceedings will be streamed live through the Bassetti Foundation website, but I am travelling half way round the world to be there in person. It will also be available later on podcast, and I think will be a very interesting debate. I will let you know next week how it all goes. Invitation enclosed.